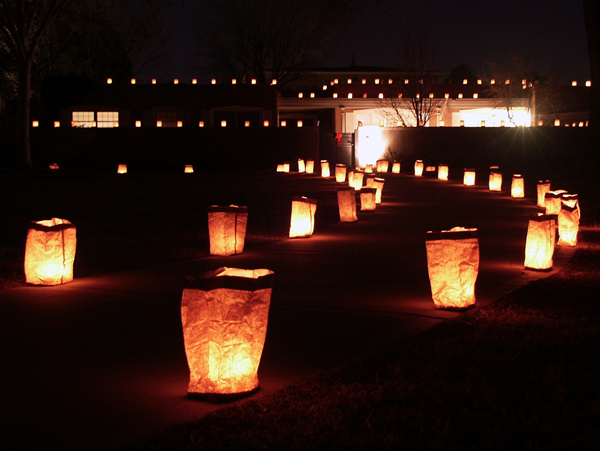 One of the simplest types of outdoor lights are known as luminaria. They are popular in the Southwestern US and are often used in large quantities to line paths or circle special places. Christmas Eve display in Albequerque, New Mexico. Image courtesy of Wikimedia Commons. They couldn't be simpler, and they look great! Take a clean paper lunch bag - recycled is fine. The classic colours are brown or white. People now make decorative bags just for this purpose but you can use regular old lunch bags. If you want to, decorate them yourself. Cut or punch holes in a design or stamp or draw on them with a marker. Open the bag and fold the top down like a cuff about one inch to keep the top open. Fill the bag with about two inches of sand or kitty litter. Place a tealight in its aluminum cup in each bag, twisting or wiggling it a bit to seat it firmly in the sand. Using a long fireplace match or long-necked barbeque lighter, light your tealights. Don't burn your hand or the bag. Set the bags out in the locations you want. Make a pattern, spell a word, light a path, cover your front yard! Just make sure you don't put them where open flames would be dangerous. Think twice about doing this if it's windy or there are blowing dry leaves in the vicinity.